Iâ€™m not sure I know what a sense of humor tastes like, but Iâ€™m willing to learn. Inside, the bar is wrapped first in foil, then with a nifty red and black interior label with some graphical flair. And believe me, this chocolate is worth the extra protection. Dark Secrets is 55% cocoa, and indeed tastes like itâ€™s made from the superior ingredients promised. So time now for the eating. Simply put, this chocolate is delicious. To me, itâ€™s in the perfect middle ground between milk chocolate (often too sweet), and that kind of dark chocolate that doesnâ€™t even taste like candy or (in bad cases) tastes like a bitter plant. 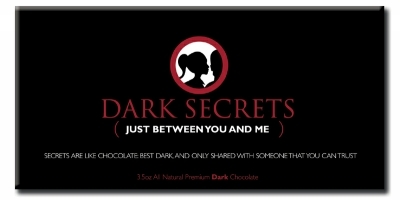 Instead, Dark Secrets is very flavorful like quality dark chocolates, yet sweet enough to be a toothsome treat. I think I’ll try one more piece. Now that the entire bar is gone, I can report that Dark Secrets also had a great snap to it, excellent cocoa butter feel (without tasting oily or fatty), and an aromatic, slight fruit aroma. Wow, those kiwis at Bloomsberry & Co. know what theyâ€™re doing. That was great stuff. So, okay, I donâ€™t remember laughing from the astounding wit of this barâ€™s alleged sense of humor, but like a good comic, this chocolate made me feel good, and hungry for more. ooo sounds yummy! and just in time for valentine’s day! Wish I could get some here in the USA. *feels patriotic right now* nz chocolate is amazing! NZ chocolate is great because thier dairy is richer than anywhere else. I have lived in USA, NZ and Australia, and NZ dairy is creamier and richer than anywhere else. They’re available in the USA, via the online links or at World Market if you have one near you. They had ones for x-mas at Raley’s for 99 cents each from the same company. I bought three, and I can agree, they are delicious! It has to be some of the best chocolate I have ever tasted. My all time favorite is Original Hawaiian Chocolate Co. If you ever see chocolate from Bloomsberg in NZ BUY IT! I don’t know what I was typing… Bloomsberry AND Co.. Im tired! I’m on my way to NZ in a couple of weeks . A great place to visit. Can’t wait to find in a Dark Secrets Bar. wow wow wow wow wow wow that sounds sooooo good if only I could find it at world market. Does this website have it though?